Android 8.0 Oreo was released back in August of last year, but it has taken Samsung many months to even begin an official beta program for the update. The beta program was our first introduction to the new Samsung Experience 9.0, but unfortunately, it was limited to the Samsung Galaxy S8/S8+ and unofficially available on the Samsung Galaxy Note8. However, by a stroke of luck, some users in Vietnam (via SamMobile) began receiving the Android Oreo update on their Samsung Galaxy S7 Edge. Thanks to this, any Exynos Samsung Galaxy S7 Edge can now enjoy Android 8.0 Oreo with Samsung Experience 9.0! 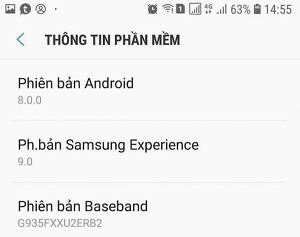 Vietnamese Samsung Galaxy S7 Edge User Accidentally Receives Android Oreo. Via SamMobile. Initially, users were rightfully skeptical of the claim that Samsung rolled out Oreo to users in Vietnam. After all, it’s rather easy to fake screenshots, isn’t it? Why would Samsung roll out Oreo to the Galaxy S7 or S7 Edge before rolling it out to its flagship models, the Samsung Galaxy S8/S8+/Note8? Indeed, while these reports seemed fake at first, but we can now confirm their authenticity. Earlier today, XDA Senior Member Kill-Switch posted a system and kernel dump from this alleged leaked S7 Edge Oreo build. Thanks to this, XDA Senior Member ProtoDeVNan0 was able to quickly put together a ROM that can be flashed on any Samsung Galaxy S7 Edge (Exynos). This ROM is based on the leaked firmware, and it brings Android 8.0 Oreo with Samsung Experience 9.0 to the Galaxy S7 Edge. If you are a lucky owner of the Samsung Galaxy S7 Edge Exynos model, then you can upgrade unofficially to Android Oreo right now thanks to this ROM! You’ll be able to enjoy Samsung Experience 9.0 before most Samsung Galaxy S8/S8+ owners (excluding those users who followed our guide on manually updating to Oreo). The only requirement is that your bootloader is unlocked (easy for Exynos models) and you have flashed TWRP onto your device. I will link the TWRP thread that contains detailed instructions on unlocking your bootloader and flashing the custom recovery, as well as the S7 Edge firmware that you can install right now. Please read each thread thoroughly before proceeding with modifying anything on your device! Thanks XDA Member dylanneve1 for the tip!